When you’re 40, you just don’t have the time anymore. You don’t have time for phonies, snobs and career sharks. Conversations about someone’s endless pursuit of the latest luxury item not only prove exceptionally boring, but feel empty. The clock of mortality, after all, is ticking, and I’d rather not waste my time. Last week, it was in this spirit that I stopped reading a recently released crime novel. Eighty pages into it, I found it to be poorly written with a boring story and unconvincing set of characters. In a word … Blah. The fact that others who are passionate about writing have enjoyed this book reminded me of just how subjective this whole business is. I kept telling myself, An editor bought this book. What did he see that I don’t? Regardless, I’m 40. And I didn’t have the time. 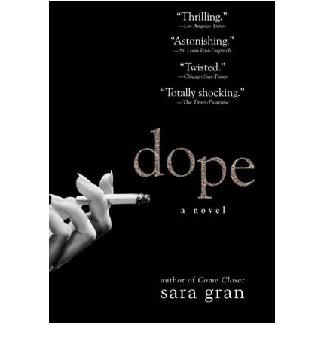 So I moved on and picked up a sublime, tightly crafted slice of noir that my boss Terry had given me — “Dope,” by Sara Gran. “Dope” follows a recovered drug addict in 1950s New York City as she navigates through a world of fiends, whores, con men and crooked cops in her search for a missing Barnard coed. Between the great characters, the enveloping sense of place and time, the tight and graceful prose and a phenomenal series of plot twists, I was captured. I devoured the book in no time, and loved every page. Time well spent for this 40-year-old. Greg Bardsley is the author of The Bob Watson  and Cash Out , which was listed by the New York Times as one of five notable novels written about Silicon Valley. His award-winning short fiction has appeared in numerous journals and anthologies. A former columnist and speechwriter, he lives in the San Francisco Bay area. I’ll definitely add this to my list to read. If I could figure out how to do without sleep I might be able to make a dent in the stack. Dope was great. But wait till you see how little you have time for at 60. I couldn’t agree more about life being too short to waste any of it on a poorly written book. I used to give a book 50 pages to capture my attention…my threshold (now that I have a child, husband, and career) is now 25 pages. My husband turned 40 last week…I wonder if he’ll have any fun revelations like yours.